Sorry, no Aina Haina vacation rentals match your search. Aina Haina on Oahu's scenic southeast shore is an ideal place to experience the beauty of Hawaii in a serene and tranquil setting with easy access to all the excitement of Waikiki and downtown Honolulu as well as the many attractions on Oahu's southern coast and beyond. Considered the heart of East Honolulu, Aina Haina is part of a larger district including Hawaii Loa Ridge, Niu Valley and the Aina Haina beachfront. Visit Kawaikui Beach Park in Aina Haina for relaxation and water activities. At Aina Hana field you'll find basketball and tennis courts as well as a playground. If you have pet check out the dog-friendly Wailupe Park. Golfers will enjoy two nearby courses including the Hawaii Kai Executive Course and the Championship Course, both enjoying ocean vistas. From Aina Haina it is just a short drive to the beaches, shops and restaurants of Waikiki as well as downtown Honolulu, Pearl Harbor and many interesting sights and attractions. A nice day trip from Aina Haina is a drive up the windward shore to see the expansive beaches of Waimanalo set beneath the verdant and furrowed Koolau mountains. Continue on to the north shore to see the world famous surfing beaches like Banzai Pipeline and Waimea Bay and browse the shops in historic Haleiwa town. Kawaikui Beach Park in Aina Haina is a great place to relax with picnic tables, grass lawns and plenty of shade. Kayaking can be fun here and there are some surfing spots offshore. 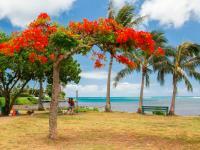 Maunalua Bay Beach Park in Hawaii Kai is frequented by canoe paddlers, kayakers and boaters. Swimming is not great due to the rocky bottom though it's a nice place to relax, have a picnic lunch and enjoy the views. Just east of Aina Haina is Hanauma Bay where you can snorkel along a coral reef in a submerged volcanic crater amidst a spectacular array of marine life. For more ocean fun head north up along the eastern shore of Oahu to the beautiful beaches of Waimanalo as well as the bays at Kailua and Kaneohe for fun ocean activities including sailing, kayaking, surfing and stand up paddle boarding. You will find some exceptional dining options at the Aina Hana Shopping Center including sushi, Chinese food and several fast food outlets as well as a grocery store and a food court. In nearby Hawaii Kai enjoy fine dining at Roy's Restaurant which emphasizes fresh, locally caught fish and organic Island produce. This award-winning restaurant was founded by Roy Yamaguchi, one of the founders of Hawaii Regional Cuisine. More restaurants can be found nearby at the Kahala Mall. Other options are found at the Ala Moana Shopping Center (with more than 80 dining choices) as well as in Waikiki and downtown Honolulu. Take a stroll along Kalakaua Avenue on the Waikiki beachfront for great seaside restaurants. Aina Haina also has a public library, post office, bank, pharmacy and gas station. There are a variety of interesting stores at the Aina Haina Shopping Center. It's just a short drive to the large Kahala Mall which offers an abundance of shops as well as movies, and frequent special events. If the Kahala Mall isn't big enough for you then it's just a 20-minute drive to the Ala Moana Shopping Center with more than 290 stores including major department stores like Nordstrom and Neiman Marcus as well as many Hawaii-based retailers offering unique local gifts. More great south shore shopping can be found by browsing the many stores along Kalakaua and Kuhio Avenues in Waikiki as well as downtown Honolulu and the eclectic shops of the Chinatown district. A rental car is recommended when staying in our Aina Haina vacation rentals so you have easy access to south shore beaches and attractions including downtown Honolulu and Waikiki as well as day trips to the north and windward shores. Aina Hana is about 30 minutes driving from the Honolulu Airport. Most major populated areas of Oahu can also be reached on the public transit system known as "TheBus." The weather in Aina Haina ranges from about 70 to 85 degrees F. throughout the year with rain and wind conditions varying through the seasons. Oahu's south and west shores are generally a bit warmer and drier than the north and east shores, and the winter months typically see more rain than summer. Sunny skies, mild temperatures and warm trade winds make Aina Haina an excellent vacation destination all through the year. Rain showers are typically brief and light with ample sunshine even on the rainier days. Hawaii's predominant trade winds blow from the northeast bringing moisture-laden clouds that typically rain onto the mountains creating green and lush landscapes.Trade winds are almost always calmest in the mornings so it's a good time to visit the beach. Ocean conditions vary each day though typically the south shore will have the calmest waters during the winter months while the north shore will have the calmest waters during the summer. Some beaches provide more protection from the open ocean, and if the waves are too big at the beach you visit then you may be able to find a more sheltered beach where water activities are safe. For swimming and ocean activities visit Oahu's lifeguarded beaches, obey all posted warnings and ask about the conditions on that day for the activities you choose. Our Aina Haina vacation rentals offer luxury and relaxation in one of Hawaii's most desired visitor destinations along Oahu's sunny southern shore. Browse through our Aina Haina vacation home listings to get an understanding of the different amenities and property features we offer. Our goal is to provide you with a with an unforgettable Aina Haina accommodation for your dream Hawaii vacation. We take pride in having the largest selection of high-quality vacation rentals on Oahu and we stand behind our product, making sure only the best of the best Aina Haina properties are listed on our site. If you have questions about our Aina Haina rentals or which Oahu destination is best for your vacation needs, please give us a call and we will be happy to assist you. Aina Haina was originally owned by one of the largest dairy farmers in the state, the Hind-Clarke Dairy. In the 1950s the land was parceled and sold, residential subdivisions were built and the eastern shore of Oahu became a new community just minutes from downtown Honolulu. The self-guided Waikiki Historical Trail will help you learn more about Oahu's south shore with informational plaques on bronze surfboards along the route which begins at the Royal Hawaiian Center in Waikiki. In downtown Honolulu you will find many historical buildings including Iolani Palace, Kawaiahao Church, and the Mission Houses Museum.